Director: Michael Miller / Writer: John Hughes / Cast: Gerrit Graham, Michael Lerner, Fred McCarren, Shelley Smith, Miriam Flynn, Stephen Furst, Blackie Dammett, Marla Pennington, Zane Buzby, Marya Small, Art Evans, Barry Diamond, Steve Tracy, Anne Ramsay, Chuck Berry. John Hughes will forever be fondly remembered as the king of teen films in the 80s. He gave us teen-angst in The Breakfast Club, teen romance in Pretty in Pink, and teen-confidence in Ferris Bueller. What did he bring us in National Lampoon’s Class Reunion? Certainly nothing to laugh about. 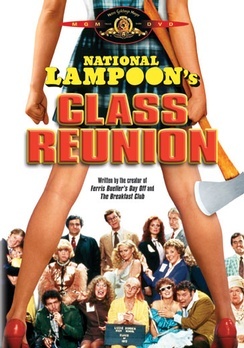 It’s another bogus reunion, organised by another bogus killer in this bogus comedy from the hit n’ miss caverns of National Lampoon. In this case, the Lizzie Borden High Class of ’72 return to their now abandoned school a decade after graduation. There, they are stalked by a loon masked by a paper bag in revenge for a Terror Train-like prank played on him at their senior prom. Unfortunately for the viewing audience, he only does away with a measly four victims – all of whom are killed off camera – while ancillary characters are allotted long inconsequential scenes in a wasted attempt to extract some giggles. Although there are a couple of amusing lines, the whole film plays like a waste of time and one might suspect Hughes didn’t actually watch any slasher films to try and make the spoofing accurate, rather than sticking to bland gags about demonic possession, blindness, dope, and cowardice. A good cast is wasted (not to mention spared). Skip it and go straight to Pandemonium. Blurbs-of-interest: Gerrit Graham was in Child’s Play 2; Stephen Furst was also in The Unseen and Silent Rage (also directed by Michael Miller); Michael Lerner was in Maniac Cop 2.
got that straight. You better go with Pandemonium, while I’ll ditch this for Student Bodies.